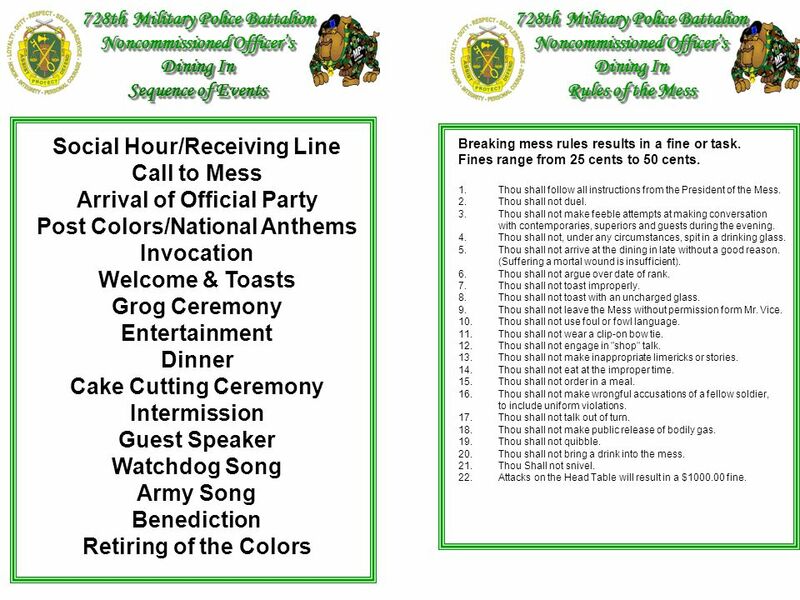 Points of Order 728th Military Police Battalion Noncommissioned Officer’s Dining In Toasts How to conduct a point of order: During dinner, a member of the mess may wish to be recognized for some appropriate reason. In such a case, the soldier will stand and wait to be recognized. Mr. Vice addresses him/her. The soldier states their name and rank then says, “Mr. Vice, I have a point of order.” Mr. Vice will then give the accused a chance for rebuttal. 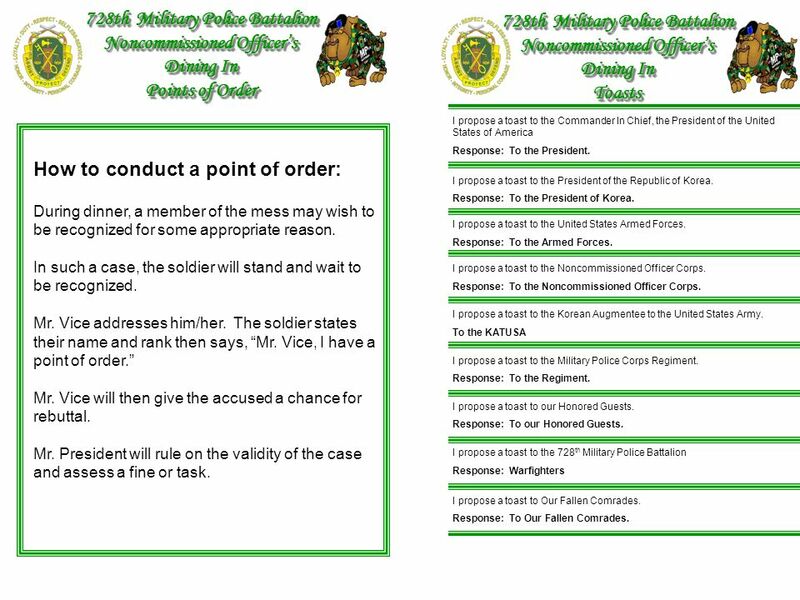 Mr. President will rule on the validity of the case and assess a fine or task. I propose a toast to the Commander In Chief, the President of the United States of America Response: To the President. I propose a toast to the President of the Republic of Korea. Response: To the President of Korea. I propose a toast to the United States Armed Forces. Response: To the Armed Forces. I propose a toast to the Noncommissioned Officer Corps. Response: To the Noncommissioned Officer Corps. I propose a toast to the Korean Augmentee to the United States Army. To the KATUSA I propose a toast to the Military Police Corps Regiment. Response: To the Regiment. I propose a toast to our Honored Guests. Response: To our Honored Guests. I propose a toast to the 728th Military Police Battalion Response: Warfighters I propose a toast to Our Fallen Comrades. Response: To Our Fallen Comrades. Tony E. Moore 20th Area Support Group Command Sergeant Major Command Sergeant Major Michael T. Sampson 728th Military Police Battalion Command Sergeant Major Command Sergeant Major Tony E. Moore is the Command Sergeant Major for the 20th Support Group and Area IV, Camp Henry, Korea. He entered the Army on August 2, 1977, and attended Basic Training and Advanced Individual Training at Fort Dix, New Jersey. During his career, CSM Moore has served in a variety of staff and leadership positions to include instructor/small group leader for Advanced Individual Training, Basic Noncommissioned Officer Course, Advance Noncommissioned Officer Course, Senior Supply Sergeant Course, Warrant Officer Candidate Course, Quartermaster Officer Basic Course, and Quartermaster Officer Advance Course all at Fort Lee, Virginia. Additionally, he has been a platoon sergeant, equal opportunity advisor, first sergeant and a battalion command sergeant major. CSM Moore has served with the Nike Hercules Weapons Support Detachment-Korea, Camp Humphreys; Service Battery, 1/73rd Field Artillery and 1/6th Field Artillery, Fort Bragg, North Carolina; 278th Maintenance Company (GS), Fort Devens, Massachusetts; 5th Maintenance Company and 5th Quartermaster Detachment, Kaiserslautern, Germany; and the 29th Support Group, Kaiserslautern, Germany. Other assignments include the Supply Company, 1st Support Battalion, Sinai, Egypt; 89th Military Police Brigade, Fort Hood, Texas; 348th Quartermaster Company, 194th Maintenance Battalion, Camp Humphreys, Korea; and Headquarters and Headquarters Detachment & Company A, 203rd Forward Support Battalion, 3rd Infantry Division, Fort Benning, Georgia. CSM Moore served as the command sergeant major for the 25th Brigade Support Battalion, 25th Infantry Division (Light), Fort Lewis, Washington, before assuming his current position in June 2002. The Fremont, North Carolina native's military education includes the Basic Leadership Course, Primary Leadership Development Course, Basic Noncommissioned Officer Course, Advance Noncommissioned Officer Course, and Senior Supply Sergeant Course all at Fort Lee, Virginia. He is also a graduate of the Defense Equal Opportunity Management Institute, Patrick Air Force Base, Florida; First Sergeant Course, Fort Bliss Texas; Garrison Command Sergeants Major Course, Fort Belvoir, Virginia; and the U.S. Army Command Sergeants Major Course (Class #50) at Fort Bliss, Texas. CSM Moore holds a Bachelor of Science degree in Liberal Studies from Excelsior College. CSM Moore's awards and decorations include the Meritorious Service Medal with two Oak Leaf Clusters, Army Joint Service Commendation Medal, Army Commendation Medal with three Oak Leaf Clusters, Army Achievement Medal with three Oak Leaf Clusters, Good Conduct Medal (8th Award), National Defense Service Ribbon, NCO Professional Development Ribbon with Numeral 4, Army Service Ribbon, and Overseas Service Ribbon with Numeral 3 and Multiforce and Observance Ribbon Numeral 2. CSM Sampson hails from Louisville, Kentucky. He enlisted in the US Army in July 1983 and attended One Station Unit Training (OSUT) at Ft McClellan, AL. 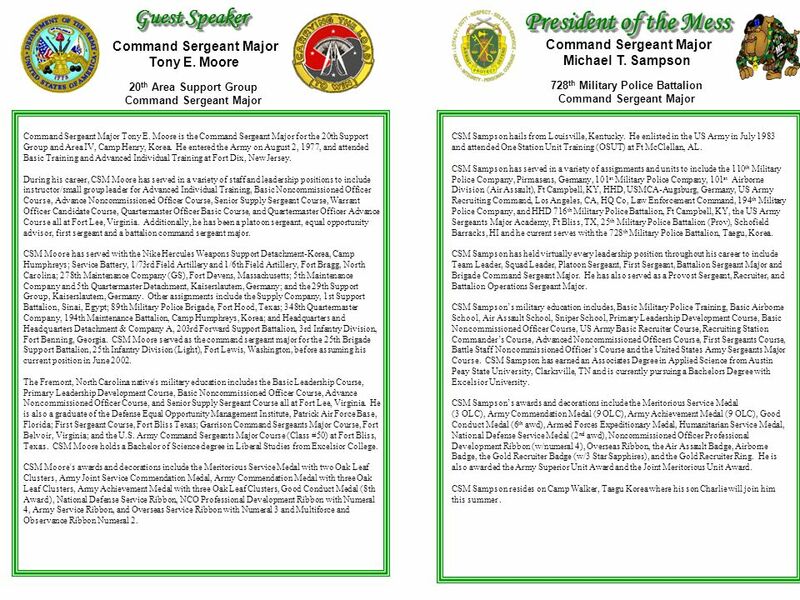 CSM Sampson has served in a variety of assignments and units to include the 110th Military Police Company, Pirmasens, Germany, 101st Military Police Company, 101st Airborne Division (Air Assault), Ft Campbell, KY, HHD, USMCA-Augsburg, Germany, US Army Recruiting Command, Los Angeles, CA, HQ Co, Law Enforcement Command, 194th Military Police Company, and HHD 716th Military Police Battalion, Ft Campbell, KY, the US Army Sergeants Major Academy, Ft Bliss, TX, 25th Military Police Battalion (Prov), Schofield Barracks, HI and he current serves with the 728th Military Police Battalion, Taegu, Korea. CSM Sampson has held virtually every leadership position throughout his career to include Team Leader, Squad Leader, Platoon Sergeant, First Sergeant, Battalion Sergeant Major and Brigade Command Sergeant Major. He has also served as a Provost Sergeant, Recruiter, and Battalion Operations Sergeant Major. CSM Sampson’s military education includes, Basic Military Police Training, Basic Airborne School, Air Assault School, Sniper School, Primary Leadership Development Course, Basic Noncommissioned Officer Course, US Army Basic Recruiter Course, Recruiting Station Commander’s Course, Advanced Noncommissioned Officers Course, First Sergeants Course, Battle Staff Noncommissioned Officer’s Course and the United States Army Sergeants Major Course. CSM Sampson has earned an Associates Degree in Applied Science from Austin Peay State University, Clarksville, TN and is currently pursuing a Bachelors Degree with Excelsior University. CSM Sampson’s awards and decorations include the Meritorious Service Medal (3 OLC), Army Commendation Medal (9 OLC), Army Achievement Medal (9 OLC), Good Conduct Medal (6th awd), Armed Forces Expeditionary Medal, Humanitarian Service Medal, National Defense Service Medal (2nd awd), Noncommissioned Officer Professional Development Ribbon (w/numeral 4), Overseas Ribbon, the Air Assault Badge, Airborne Badge, the Gold Recruiter Badge (w/3 Star Sapphires), and the Gold Recruiter Ring. He is also awarded the Army Superior Unit Award and the Joint Meritorious Unit Award. CSM Sampson resides on Camp Walker, Taegu Korea where his son Charlie will join him this summer . 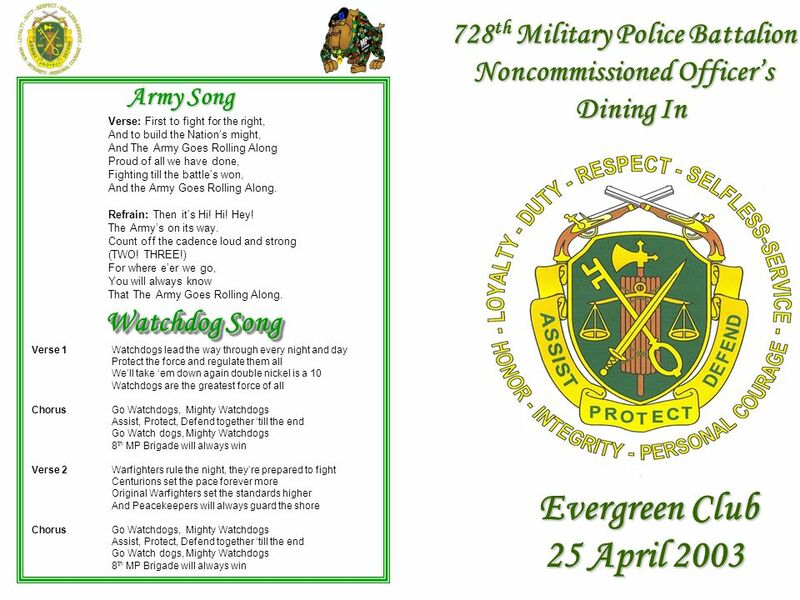 Download ppt "728th Military Police Battalion Noncommissioned Officer’s"
KINGS BAY CPOA DINING IN 12 MAR History History The term dining-in derives from an old Viking tradition celebrating great battles and feasts of. Pre-Shipper Brief and Counseling. 2 Terminal Learning Objective Action: Receive Pre-Shipper Brief and Counseling Conditions: Given RSP Pre-Ship Packet. North West Sports League Football Rules 1.All normal F.A. rules apply 2.All teams must adhere to FA Respect Programme. 3.Each college / 6 th Form must. Course Synopsis Mission Organization JROTC: The Class, The Club, The Sport. Memorial Ceremony SGT Christina Smith February 20, 1979 – September 30, 2008 JFK Memorial Chapel Fort Bragg, North Carolina October 8, 2008 While assigned. Army Center of Excellence, Subsistence 10 May 2015 ENLISTED AIDE TRAINING COURSE OVERVIEW. YOUR UNIT HERE NCO INDUCTION CEREMONY 4 November 1999 HOSTED BY YOUR UNIT HERE. 5 Oct 2013 Issue 1 Monthly Page 1 of 2 Bellaire High School JROTC SY Inside this issue: Senior Army Instructor’s BIO LET2 Army Instructor’s BIO. Tyrus R. Cobb, Jr. Graduating from the US Military Academy in 1962 with a BS in engineering, Mr. Cobb was commissioned a 2LT of infantry. He served. UNCLASSIFIED. A soldier from the 8th Iraqi Army, watches as applicants line up to register for the Sons of Iraq in Diwaniyah, Iraq, Oct. 23, 2008. After.